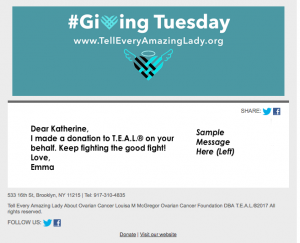 The 5th Annual T.E.A.L. Walk/Run Is a Great Success! This year, the 5th Annual T.E.A.L. Walk/Run, taking place on the clear and sunny morning of September 7th, was the largest to date. 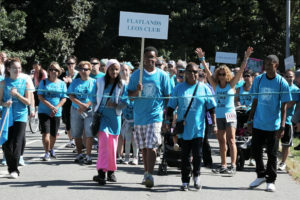 Thousands of enthusiastic participants showed their support to the cause, and celebrated the very first T.E.A.L. 5K Run. The day kicked off at 9am when over 250 participants took part in an exciting timed 5K race organized with the help of NYCRUNS. Following the Run, singer Linda Haviv sang the National Anthem, and Ovarian Cancer Survivors were honored at the Survivor’s Ceremony taking place on stage at the Park Bandshell. Just under 100 Ovarian Cancer survivors were invited on stage to accept a single white rose from the parents of Louisa M. McGregor and Pamela Esposito-Amery, the founders of the organization, as a symbol of their unceasing hope and courage in the face of struggle. American Idol Semi-finalist Brielle Von Hugel provided musical accompaniment as the survivors walked across the stage and accepted their rose. Brooklyn Borough President Marty Markowitz and WABC News reporter Stacey Sager helped kick off the Walk, as participants proudly walked the 2.5 course with family and friends, dressed head to toe in their teal garb. After the Walk, walkers and runners congregated at the Bandshell for a live performance by Brooklyn-based artist Alyson Greenfield, as well as stage interviews with Ovarian Cancer Survivors conducted by WABC News reporter and Ovarian Cancer Survivor Stacey Sager. Register here for the 2014 Walk/5k Run!